Published on 24 March 2012. I’m just about to put this watch forward an hour, as we move onto British Summer Time. This is the watch I wear most days. I wear it on my right wrist, which I know is classically bad form. It’s very similar to the Casio F91Ws I used to wear as a child, and there’s something comforting in the familiarity of it. I was slightly caught out by this watch on 29th February: it’s assertion that it was 1st March had me fooled for most of the morning! It slightly amuses me that my digital watch can’t cope with the leap year, but my dressier analogue watch recalls it almost perfectly – it works in four-year cycles, so can’t cope with the more detailed finesse of the leap-year system. 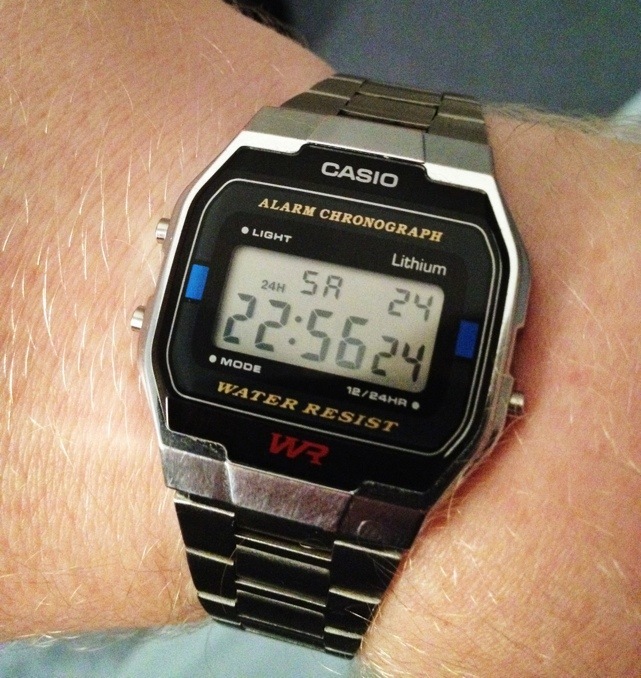 This 1,580th post was filed under: Photo-a-day 2012, Casio, watches.